Having already sampled the delights of the amazing screen at neighbouring Hempstead, we had passed through this village, and seen the apparently 14th century tower sticking above the house tops. Coming back, we found you had to drive almost a mile out of the village and then return towards the church on a minor track; there is a footpath from the village, but no vehicular approach, which I rather thought was just as it should be. As with other churches in the benefice, All Saints is welcoming to pilgrims and strangers; indeed, this church is militantly open, with a large 'welcome' board up on the top road. I said in the previous paragraph that the tower was apparently 14th century. This is because, despite the tracery of the bell windows, it has certainly been at least completely refaced; and the bell windows themselves match the 19th century ones installed during the rebuilding of the nave by Diocesan architect Herbert Green in the 1890s. Photographs of the church before the restoration show it as pretty much a complete ruin, with only the chancel in use. Green restored the whole building, allowing the congregation to move back into the nave, and so it was with some irony that the chancel was severely damaged by a storm in October 1961. I am indebted to Bob Henderson for this information. 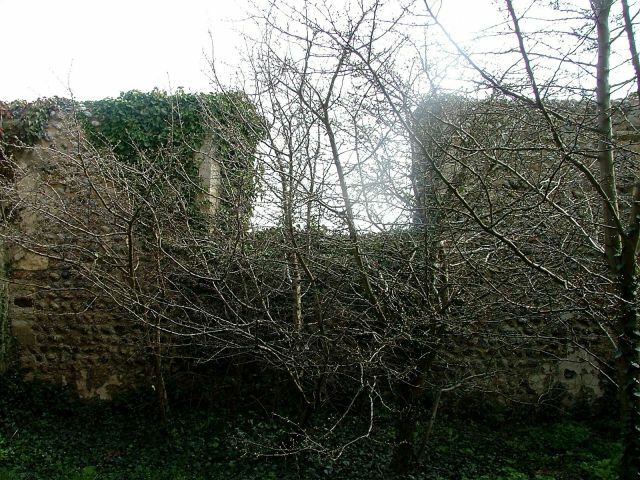 It was decided to block off the chancel and make the ruin safe, creating the fine thatched space we see to day, with what is effectively a walled garden on the site of the chancel. 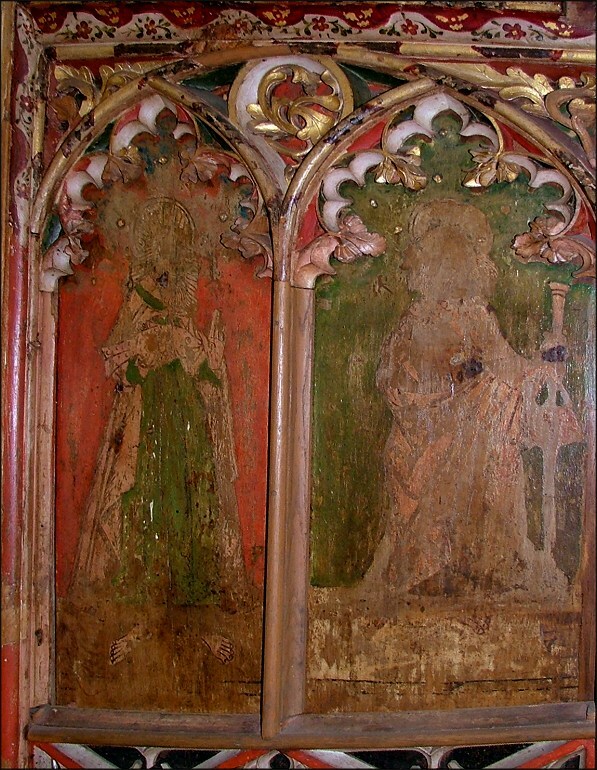 Before the chancel was demolished, All Saints had the surviving panels of a splendid rood screen with twelve painted figures. I had read much about it. Although much later than the screen at Hempstead, it was of particular interest because, as well as the twelve figures of apostles, there were further figures which had been superimposed on paper some time in the 16th century; perhaps, unusually, during the 1550s reign of Mary I. 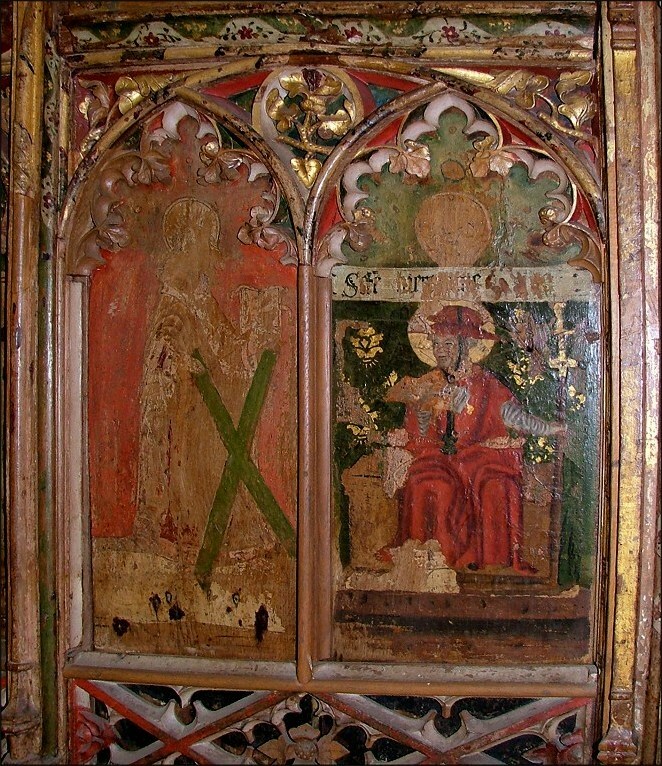 The screen is no longer in Lessingham church, and for reasons that will become apparent there is some dispute about the identities of the figures on the panels. I had read the Norfolk Museums Service record, but this did not completely agree with an account that Chris Harrison had found by WW Williamson in Norfolk Archaeology in 1950. Williamson had seen the screen in situ. 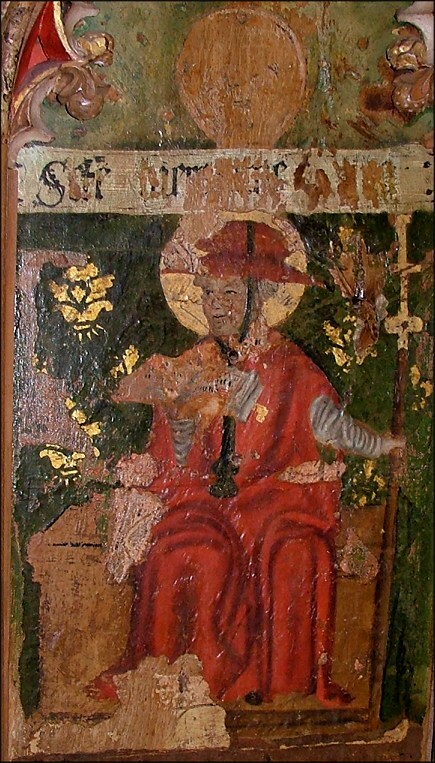 The Norfolk Museums Service record shows that the panels depict, from north to south, I: St Thomas (St Gregory superimposed), II: St Matthew (superimposed figure removed), III: St Simon, IV: St James, V: St Andrew, VI: St Peter (St Jerome superimposed) VII: unidentified figure, VIII: unidentified figure (St Augustine superimposed), unidentified figure (St Ambrose superimposed), St Philip, St Jude, St James the Less. Williamson's account differs slightly. 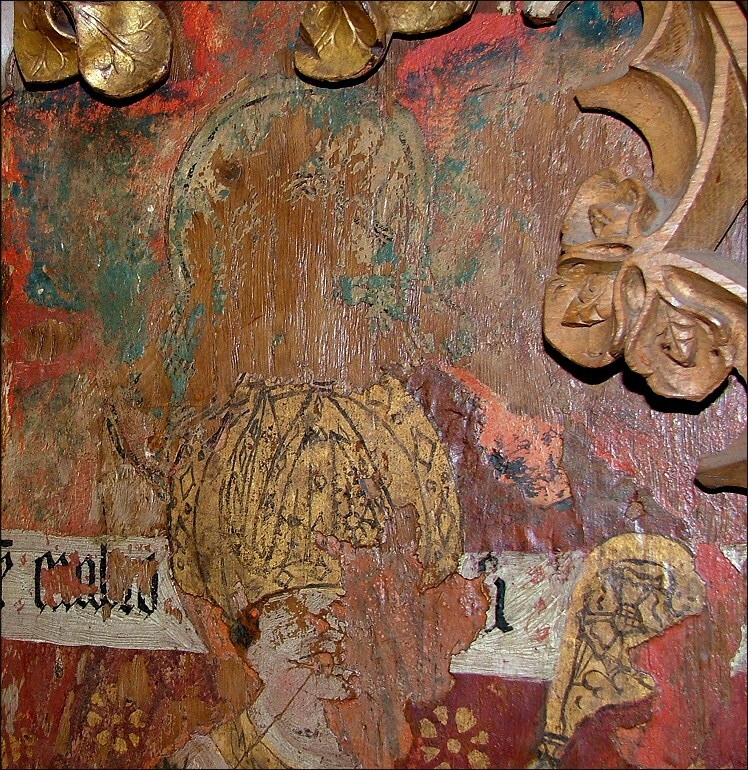 He saw, from north to south, I: possibly St Roche - but panel hidden behind pulpit and damaged, II: possibly St Matthew with halberd (damaged), III: probably St Simon with fish (damaged), IV: St James as pilgrim, V: St Andrew with cross saltire, VI: St Jerome as Cardinal seated, VII:St Gregory defaced and seated, VIII: St Augustine as Bishop and seated, IX: St Ambrose as Bishop and seated, X: probably St Philip with basket of loaves, XI: St Jude with boat and XII: St James the Less with fuller's club. There were once doors, with two panels each. These depicted St Apollonia, St Catherine, St Margaret, and St Mary of Magdala. 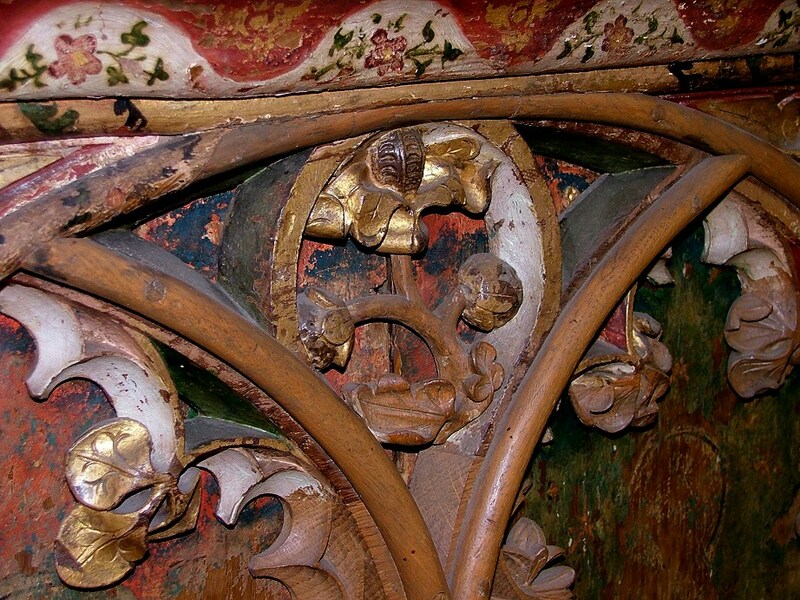 Williamson identified two of these, and one other, as being loose panels in the vestry in 1950. Their location since is unclear. Green moved the screen into its original position at the entrance to the chancel, but after the destruction of the chancel and the blocking off of the arch, it was moved to an unsatisfactory position at the west end of the nave. 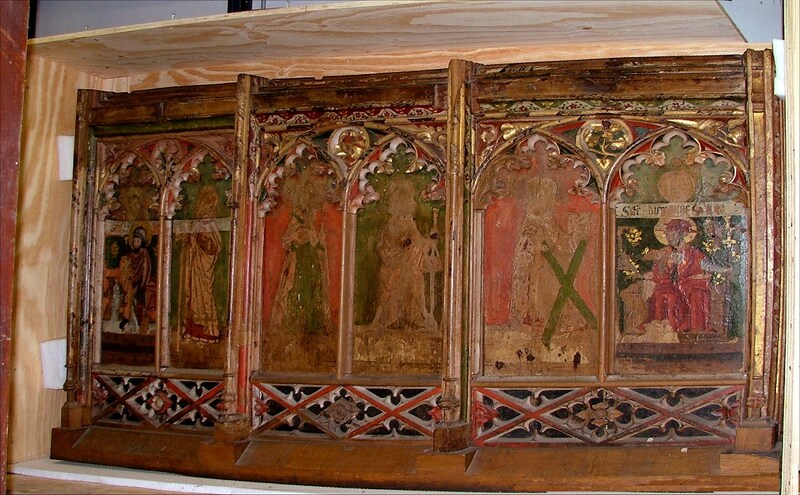 After a couple of years, it was decided to loan it to the church furnishings museum at St Peter Hungate in Norwich, where it would be a star attraction, and in 1968 the screen headed off to the big city. However, when public spending cuts forced the closure of that museum in the 1990s (it now lies empty, awaiting a new use) the screen went into storage, in the depths of Norwich castle. In 1995, it was moved to the Architectural Service archive at Gressenhall. The two sides were packed into enormous pine cases, and screwed up tightly to prevent them rattling around. One hot summer day in 2006, I went with Chris Harrison to visit the archive. It was like stepping into Aladdin's cave. The kind archivist unscrewed the front of the two cases, and revealed the wonders inside. It was the first time that the cases had been opened, the first time the screen had been seen for eleven years. I hope I don't sound immodest if I say I felt a little like Howard Carter. The screen is intricate and flowery, full of the flavour of the English Renaissance -or, at least, what it might have been if puritanism hadn't intervened. 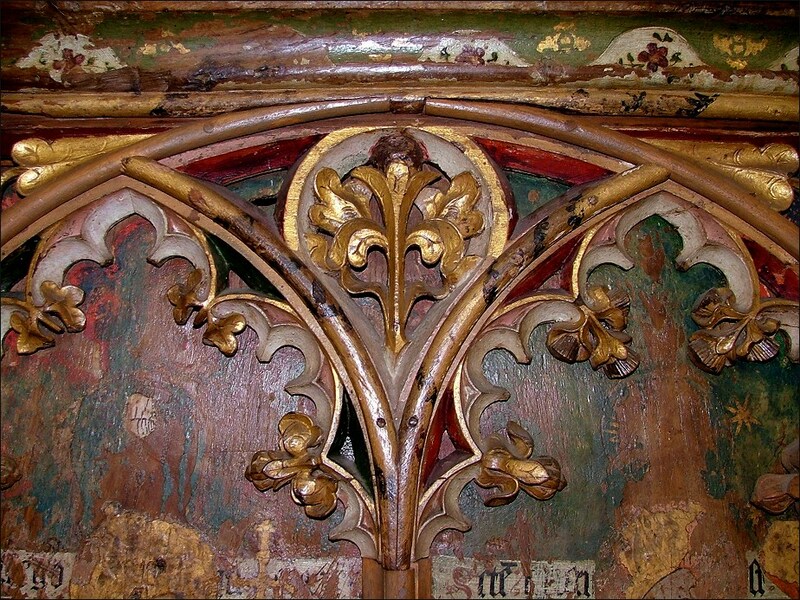 This suggests that the construction of the screen itself is quite late, perhaps early in the 16th century. 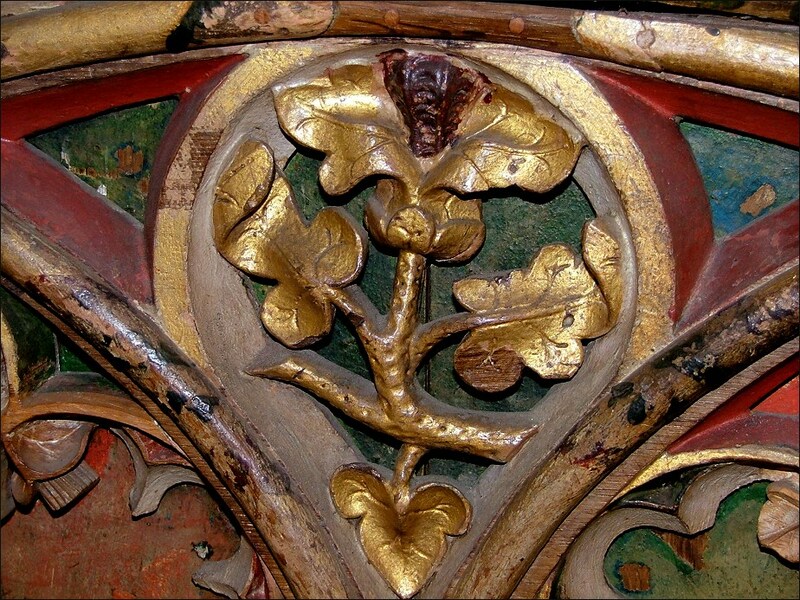 It has been heavily restored, presumably by Green; the base is new, as are some of the uprights. Holes where buttressing might have been attached have been cut out and filled. The figures are painted in two, possibly three, distinct styles. The original twelve are all by the same artist, and depict the eleven disciples and one other, possibly St Paul. Where a paper figure has been superimposed, there is a white banner with a legend about two-thirds of the way up the panel. This appears on panels I, II, VI, VII, VIII and IX. Curiously, there is a break in the background painting at the same point in panels XI and XII - could they also have been superimposed? Or, intriguingly, were they prepared, but the imposition never carried out? 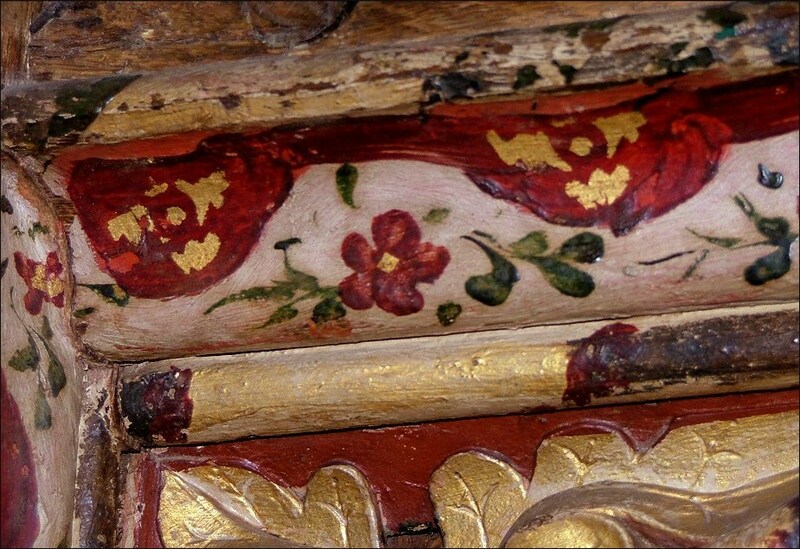 Gessowork flowers are discernible on at least one of the panels, St Thomas, and probably date from the original decoration of the screen. They may have been generally removed before superimposition. My photographs of the screen panels are below, my identification of the figures in the captions and in full below that. On the north side of the screen, figure I is, I believe, St Roche superimposed over St Thomas. The superimposed figure is seated, and lifts his cape above his leg. A figure in white, possibly an angel, points to the leg, while a little dog looks on. Unfortunately, the leg itself is obliterated, but almost certainly it shows plague sores. Now, there was a great outbreak of plague in this part of Norfolk in 1555 - St Roche also appears on the screen at nearby Stalham - so this may well be evidence of a Marian restoration. St Thomas behind holds a spear. 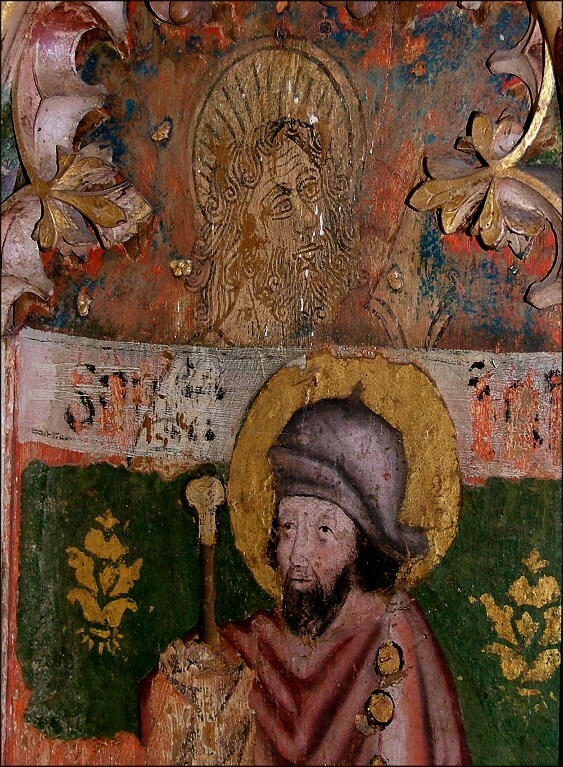 Figure II is St Matthew. A superimposed figure has been removed. 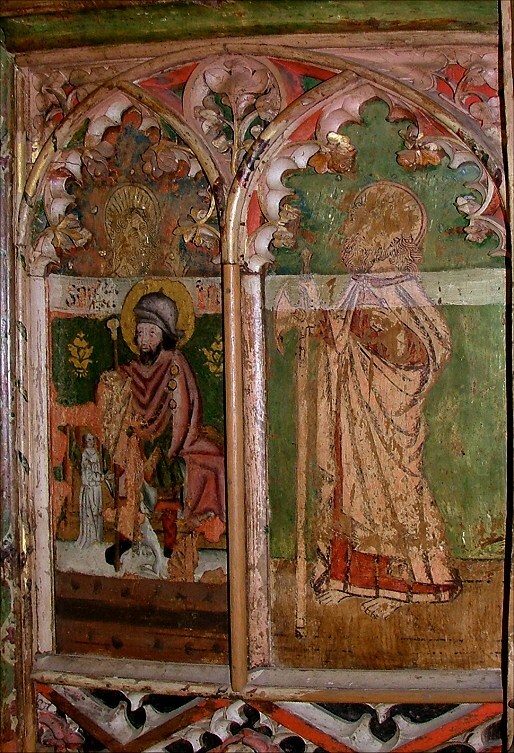 Figures III, IV and V are St Simon, St James and St Andrew. 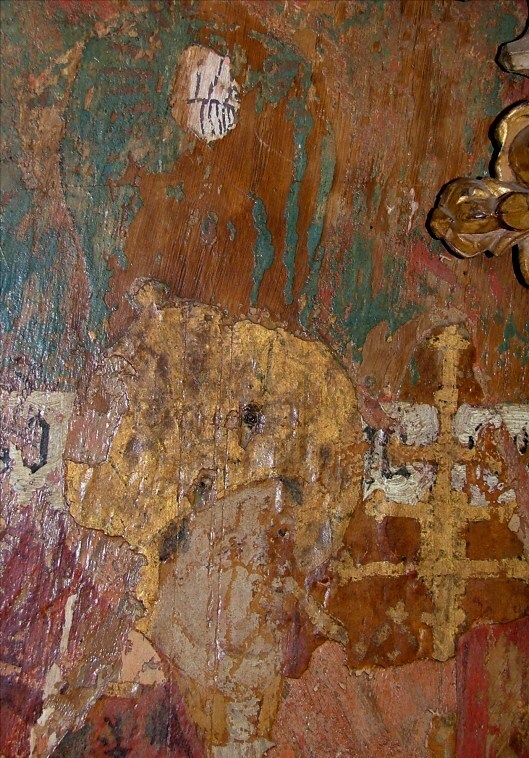 Superimposed figure VI is clearly St Jerome, wearing his cardinal's robes. 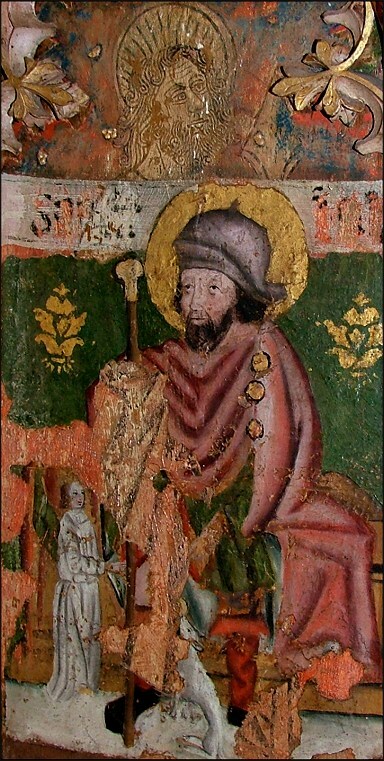 Providentially, the superimposition is damaged in exactly the right place to see that the figure behind is holding a key, and is thus St Peter. 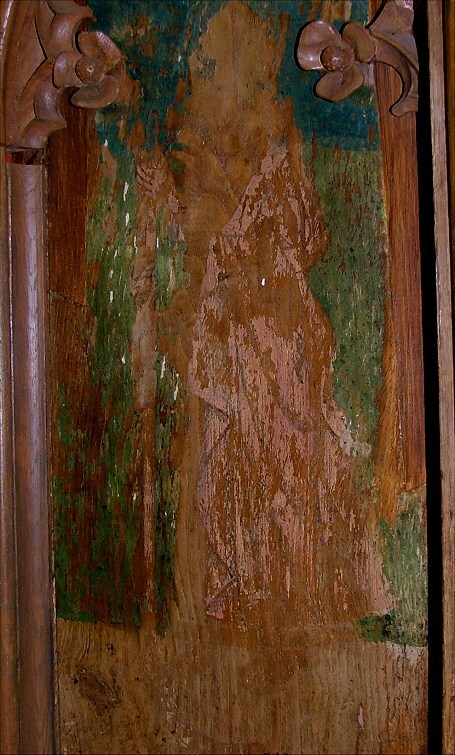 On the south side, the first figure imposed is clearly St Gregory. He wears a papal crown and carries a papal cross. The figure beneath is unidentifiable, although I believe that what appears to be a white shell on his head is actually a fragment of the later superimposition. 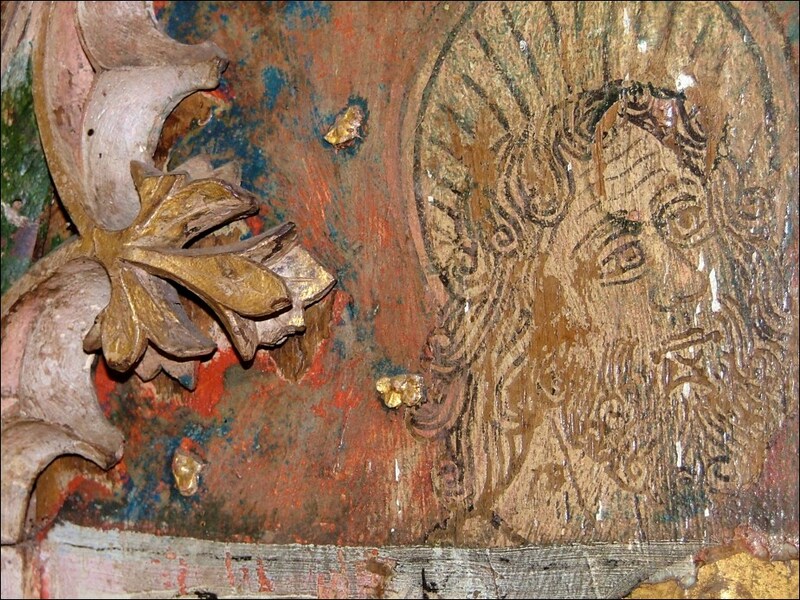 Most likely, it is St Paul to match St Peter across the doorway. Superimposed figure VIII is St Augustine, and IX is St Ambrose (Ann Elenholm Nichols' identification of this last as St Anselm is a proofing error, I think). As with panel VII, it is not possible to discern who the figures underneath are. 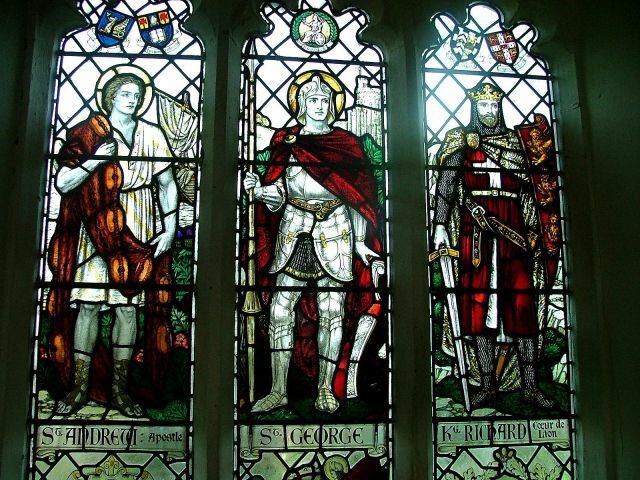 Figures X, XI and XII are St Philip and St James the Less. The last two panels appear to have been at least prepared for superimposition. So, Williamson was correct, despite the pulpit. A stunningly lovely screen, and not without a frisson of excitement. 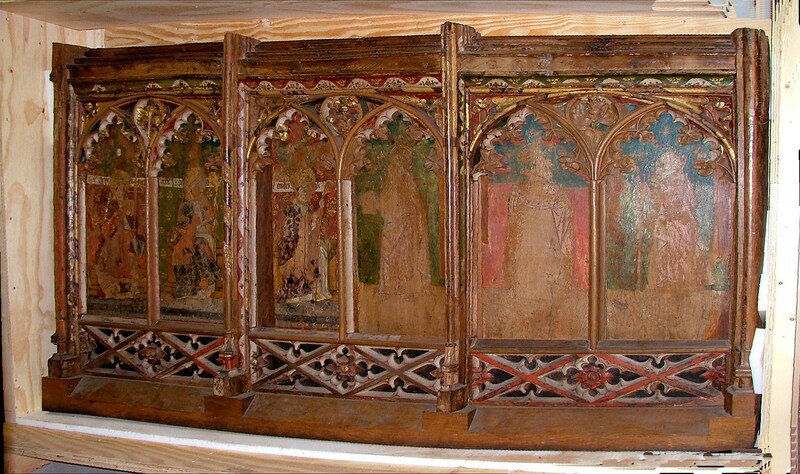 It would be nice to think that one day it could be put back on public display, possibly even at Lessingham church. And you can't help wondering what happened to the door panels. Did they also go to St Peter Hungate? Are they somewhere in storage, even now? 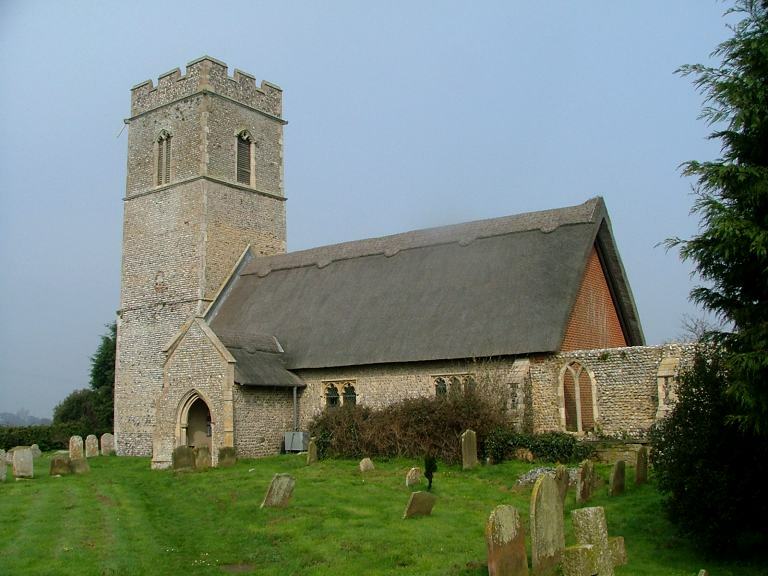 Even without its remarkable screen, All Saints remains a pleasant, well-kept, much-loved and welcoming village church. There is now nothing remarkable; the Purbeck marble font typical of this area, a decent Jacobean pulpit and tester, an unusual war memorial window that includes, as one of the Saints, Richard the Lionheart. For me, a more moving war memorial is the original handwritten roll of honour, still surviving here after almost a century.